He also understood that business cards can be your hardest-working, lowest-cost new business tool. I agree. I’m pleased at how many times people stop and look at my business cards when I hand them out. They’re simple. It’s easy to find out how to email, or call us, or get on our website. What about your card? Here’s are some quick points to evaluate how hard it’s working for you. Who do you want to reach? C-level executives? Make sure you have a C-level card with quality paper and elegant design. What do you want people to do? Visit your website? Email you? Make that easy to do. Want to tell people you’re a solid, established company? A fresh, new company? Show that in the design. Words that are important enough to put on as small a promotional piece as a business card need to be readable — especially for prospects over 40. How are you using color? Breaking the card into color blocks can leave the recipient unclear where to focus. Your card could end up in her discard pile. And, I’m still wondering about the business card that had the phone number in yellow on white card stock. Was that an hard-to-read mistake or a brilliant ploy by someone who doesn’t want phone calls? 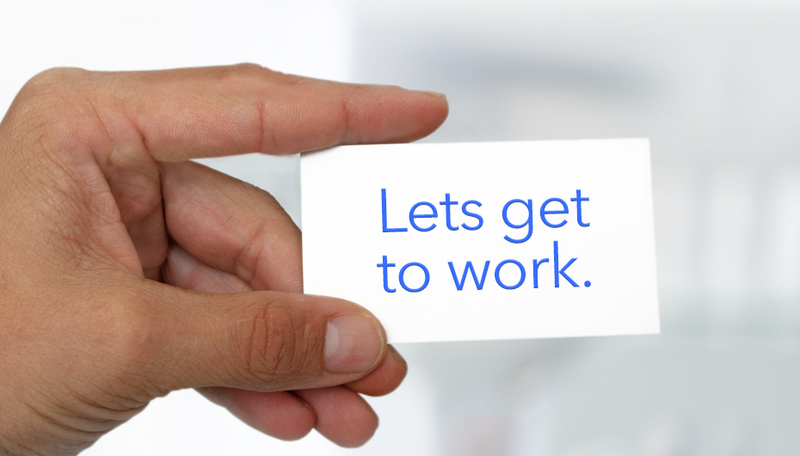 If your answers weren’t satisfactory, tell your designer or printer that you want a harder-working business card. Finally keep your card circulating. Carry it and pass it out. If a millennial sees the advantage of such a classic marketing tool, shouldn’t you? For thoughtful ideas on how to improve your marketing, contact Maggie, 609-924-1083.